My own plus quilt, inspired by this quilt. this was a fun one to make, and went together really fast. I quilted with vertical straight-ish lines (about 1-2 inches apart), and then horizontally about a half inch from my seam line of each row. (that sounds so confusing). you can see it in the following picture. I am trying really hard to use up the fabric and scraps of prints I don't like much anymore, so my plan is to use some of my less desireable fabric in every quilt I make. This is one of those prints, dark green- gingham-ish, and you know what, it's one of my favorite blocks. It works perfectly in this quilt. pretty! I'm glad to hear someone else has fabrics they no longer like, what a great idea to get them used up! it looks GREAT! love the colors you've used in it! I am totally in love with this quilt. I love everything about it. What a great quilt! Love this design and the use of colors is just great. 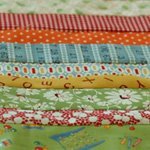 I too have quite a lot of "what was I thinking fabric" and have been trying to use it in my quilts - often with unexpected delight. A fantastic quilt! Love the colours and the quilting looks great! What a stunning quilt! Love your challenge to use some of your less favourite fabrics. I think I have some of that green gingham check too. This is very sweet. I love it. I really really love it. Great way to use up fabric. Great quilt! It really went together well. And it looks wonderfully comfortable to cuddle. I have donated quite a bit of my "not me anymore" fabric to our church, but I still have a lot left. Great idea to use a little of it in each quilt. This looks fabulous! Oh this is fantastic - I love it!! Awesome idea with using up fabric. I've got to start doing that, too. 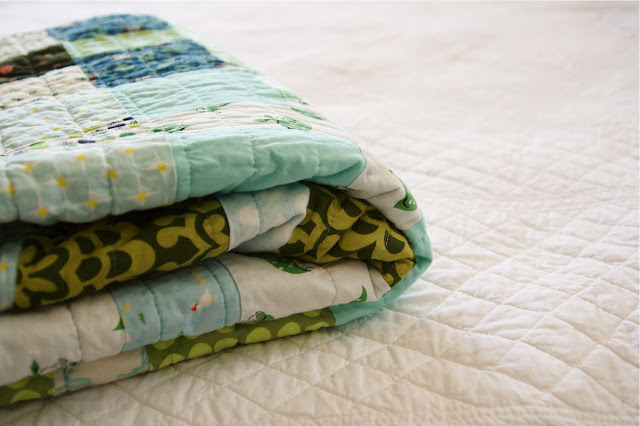 What a wonderful, fresh, yet soothing quilt. I just love the fabrics you put together. This one is no exception. Love it! I love your quilt. Is there a pattern or tutorial for this? Great quilt! I love your version of it. Beautiful quilt. Your color choices are great. that looks fantastic! i love the contrast between bolder nd paler colours. super cool! i really thought kelly mccaleb's was cute....but your's makes me want to make one too! it's just that much cuter. 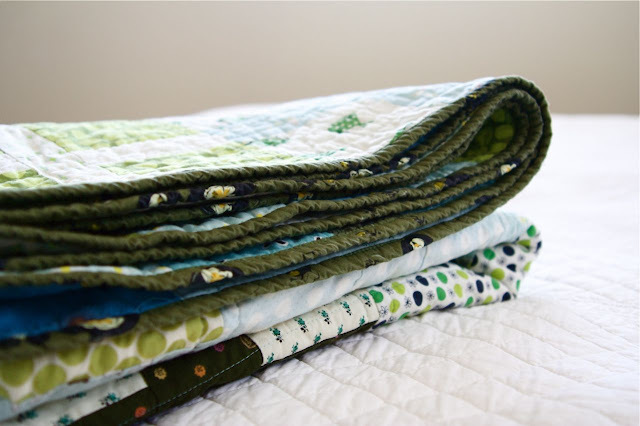 no offense to kelly, i follow her blog and i love her style and all her crafts and quilts. but still, i can't believe how you made it look so great! how funny about that fabric you thought you didn't like anymore, but how perfect it ended up in the quilt! use up some of the older fabric pieces , I put a few in each quilt I make! It is beautiful. You have such an eye for colour and pattern combinations! Looks like a fun quilt to make and what a great way to use up fabric. I love the dark green! I love the idea of using up some of the fabrics you don't love. I'm going to start working on that too. I'm doing the same thing, trying to use up my entire scrap bag on lap quilts! Going to try to sell them at a rummage sale this summer to suppliment the 'getting all the farm cats fixed' fund! You have such a lovely eye for colour. One of my quilt mentors stresses using an ugly fabric in your quilt. I think it might be a Mary Ellen Hopkins thing. And everytime I've pushed myself it ends up being something I adore. SO lovely!! I love it. Very pretty! The colors look so soothing together! Funny that you mention using the fabric you don't like because Heather Ross has made both my favorite fabric in the world and my least favorite, and both of them are in your quilt! 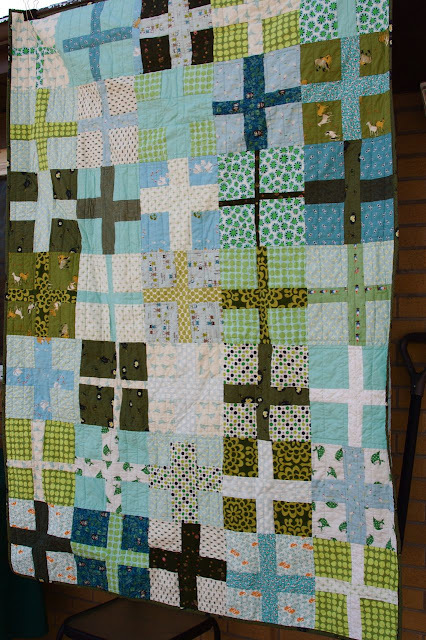 I love the quilt but that green and black frog fabric is my least favorite fabric ever. Muddy greens and browns and blacks. My favorite fabric ever is the rabbits dancing in the forest one. I only have it on tan, I wish I had it on blue like you! ohhh that quilt is so amazing!!!! i'm totally in love with it! Great Quilt - Love the idea of using a little bit of old stuff in each quilt. I have that problem of stuff I no longer am in love with. I dreamt about this quilt all night. My brain was trying to work out how you set the crosses and why they were not symmetrical.So glad I had another look. Great interpretation of the one on Etsy. Looks like a great way to use up the bits and pieces. Thank you for the photos, I will sleep easier tonight! That's a really pretty quilt. Very cute! And a great way to use up scraps! I love it! And the gingham is a perfect fabric! Love the color combo! Yum! so funny how you have fabrics in there you don't like...and they work great. 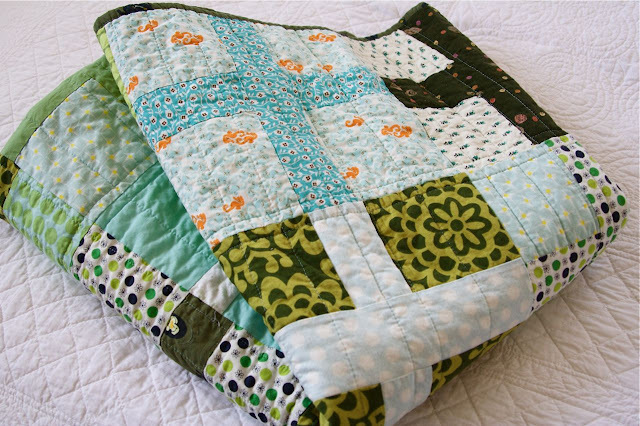 i have those fabrics too...i love this quilt...so whimsical and fun! It's positively beautiful! 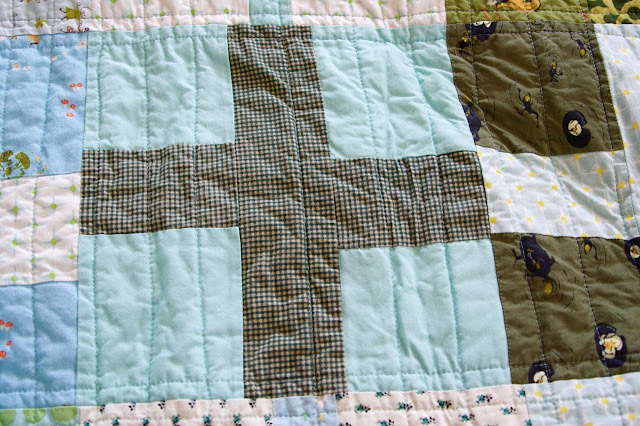 I've been thinking about making a math quilt - with plus, minus, division, subtraction, etc. So many other quilts in front of it though. oh, it's perfect! love it. love love love it! (i have to make one!!) you picked such fabulous colors! I love this quilt so much! You've inspired me to make one for my niece's 3rd birthday next month. I've got work to do! Later! Your quilt is beautiful. I love how you have quilted it. I am definitely going to use your idea for fabric I don't like anymore. Fabulous, fabulous quilt! Oh dear, this is really lovely! I want to touch it -- it looks absolutely cozy! I love that you're using some of your older fabrics. I think it makes the quilt more interesting. I love the colors in this one! I love your quilts. Im so desperate to start one of my own. I love this quilt so much. I'm attempting to make one of my own. I hope it's as awesome as yours. Thanks for sharing your photos with us. This is so cute, it makes me want to cuddle it right now! Thanks for sharing your too-cute blog, keep up the great work! I think this quilt is really awesome. It would be super helpful if you would mention where you got the pattern from - if you did. If they are your original designs, I'm sure some of us would like to purchase them from your etsy store!